The Canpactor is a Can Recycling Unit that can reduce volume of aluminum cans by 80% making the most of your available storage space. It not only removes bulk issues, but also eliminates unightly mess and contamination problems. 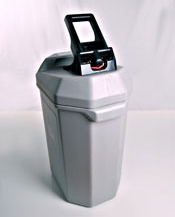 Using standard 30 gallons trash bages (not included), the Canpactor can store up to 400 cans at one time. With its safe and easy to use hand-operated crusher and convenient size, it is ideal for use in apartment/multi-family buildings, cafeterias, offices, schools, clubs, at home and other places collecting cans. The self-ejecting mechanism prevents cans from becoming stuck after ther are crushed. The Canpactor hhas an extremely durable design and fits in corners or against walls.